Financial markets fell amid fears of a trade war, as the Dow Jones industrial average dropped more than 200 points. The stocks of the “big five” defense firms followed the market, trading down amid predictions of weaker demand from abroad and rising prices at home — but they stayed well above their 52-week lows. The worst damage to U.S. defense firms may be on the horizon, should overseas defense markets ― which are heavily government-influenced ― punish America over the new tariffs. The Trump administration has sought to increase American defense exports, but analysts warn that’s now in danger. 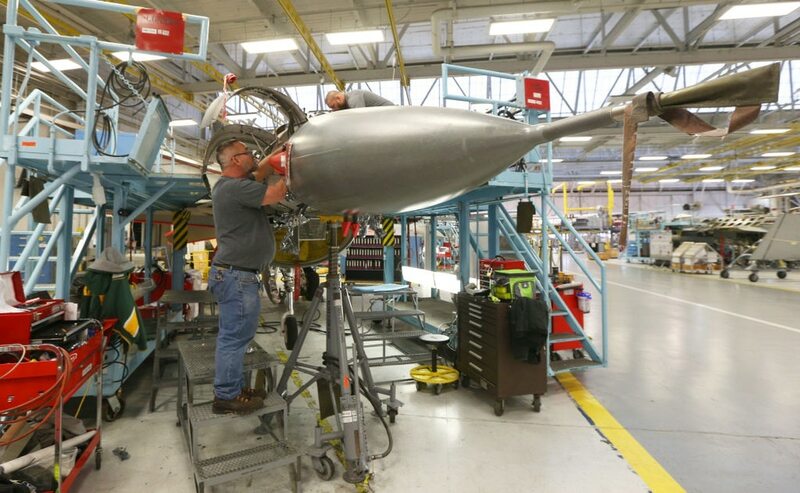 Aerospace Industries Association CEO Eric Fanning told reporters Thursday that he understands the need to focus on fair trade, but shared fears that American firms in the aerospace and defense sector could be particularly hurt by retaliation from potential customers. “We have concerns about tariffs for a number of reasons: Its impact on the global supply chain, what that could mean to our companies. Certainly what escalation might mean in retaliation,” Fanning said. He noted that AIA’s member companies rely heavily on exports and employ 2.4 million Americans with above-average paying jobs. In areas where there are no competing European products, like heavy-lift helicopters or C-130J cargo aircraft, Callan expected U.S. products to hold steady. “But if Europe has options, I would expect the U.S. will be its second choice,” Callan said. There are dimmer prospects for F-35 Joint Strike Fighter sales to Belgium, Finland and Germany — where the slim possibility has been up for debate. Germany is an “even less likely” customer now, Callan said. Brookings Institution’s Michael O’Hanlon downplayed fears of retaliation, however, citing the military interdependence among NATO allies, many of which rely on U.S. suppliers. “As such, I don’t expect dramatic repercussions — at least at this stage of the incipient would-be trade war,” O’Hanlon said. Yet, America’s defense industry, which already faces a shortage of qualified workers and other long-term challenges, could eventually see parts suppliers move operations overseas — the exact opposite of the Trump administration’s stated goal. Though the American defense industry buys the majority of its steel and aluminum from domestic suppliers, the tariffs are expected to allow those suppliers to raise prices unhindered by foreign competition. Price increases should find their way into the supply chain as firms use up their stockpiles, Hunter said. Even some Trump allies in Congress said the trade moves are a raw deal for the American public. “Tariffs on steel and aluminum imports are a tax hike on Americans and will have damaging consequences for consumers, manufacturers and workers,” said Sen. Orrin Hatch, R-Utah. Senate Armed Services Committee Chairman John McCain, R-Ariz., has said the tariffs would raise the cost of critical military systems the U.S. needs to maintain its military edge.